Author’s Note: Beginning this week, I will be writing this blog five days per week instead of six days per week. Look for it Monday through Friday each week! As we unpacked the groceries the other day after PR31 got home from shopping, I pulled the eggs out of the plastic sack to put them in the fridge. They caught my attention because they were a different brand in different packaging. The ones we normally get are in a cardboard package, and I knew that PR31 had planned to do a craft with the boys using the next package we got. These were in a plastic package which wouldn’t work for the project. She started to get the brand we normally buy, but when she opened the lid to make sure none were cracked, a couple eggs were indeed cracked. She picked up another package of the same brand, and found cracked eggs in that dozen as well. There were only several packages left of that brand, and each one she picked up had at least one cracked egg in it. So, she put them all back, and bought the other brand of eggs. She told me that she didn’t really want to get this brand, but at least they weren’t cracked. As she finished the story, she said, “Oh, my word! It just hit me… All I had to do in order to get the brand eggs I wanted was to swap out the cracked eggs in one carton for un-cracked eggs in another dozen, and I could have had a complete dozen of the ones I wanted.” It was one of those slap-your-forehead moments that made us both laugh. It was such a simple solution, but it just didn’t come to mind that day. Now this was obviously not a crisis in life. Most of us are not worried about which eggs we get. We’re just glad to be able to get eggs. Yet each of us face challenging situations in our lives which we approach with the same thought process PR31 approached buying eggs that day. We think, “Well, everything I try is messed up. I guess I won’t be able to get what I want. I suppose I’ll just have to settle for something lesser instead.” And we end up disappointed with our lives because we feel like our choices were limited. But I serve an unlimited God who can think outside the egg carton. James… Jesus’ half-brother… wrote to believers and told them in the first chapter of his letter to them that when we lack wisdom, all we have to do is ask our unlimited God. And He goes on to say that God will gladly, generously help us to think outside the egg carton, too! What challenge is it that you are facing today which seems to have you stumped? What are you ready to give up on because you can’t seem to find a way to make it work? Before you give up, let me encourage you to think about it differently. Still stuck? 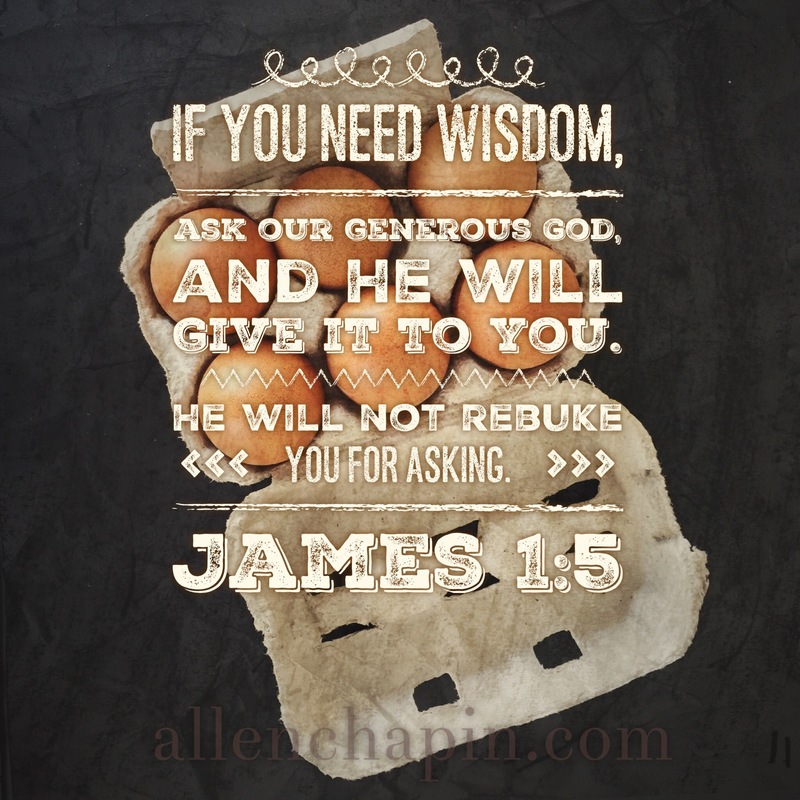 Why not do what James suggested and ask God for wisdom that goes beyond your own natural abilities? Couldn’t hurt. Could only help. Go ahead, give it a try. Who knows, you might be able to get the eggs you want! Boom go Bro Allen! I needed this today for sure!